Kris Harvey has been a volunteer at Georgetown Elementary School for 12 years and currently serves as PTA president. Because of her longtime dedication and commitment to bringing the school and community together, she is being recognized as the District 204 BMO Harris Bank Volunteer of the Month. Kris began volunteering at Georgetown in 1999 when she and her husband, Scott, and their daughter Allison, moved to the area specifically because of District 204's educational programs and opportunities. “I began volunteering through the PTA as a room mom when my daughter started kindergarten at Georgetown,” she said. “I didn’t know many people and wanted to make new friends and thought this would be a great way to get to know the teacher and give back to the school.” Today, her daughter just completed her freshman year at the University of Kentucky, and her son, Trevor, is a fourth-grader at Georgetown. As PTA president, Kris brings in guest speakers every month to the PTA meetings, which helps promote new ideas and ventures. She created and coordinates the DEAR (Drop Everything and Read) program, which brings local dignitaries and other community members to the school to share their love of reading with students. She organizes the annual PTA Ice Cream Social to welcome families to school, the Earth Day event, the annual spring clean-up and volunteers at many other events. She has held various officer roles on the PTA and is Georgetown’s liaison to the Indian Prairie Special Needs PTA. Her volunteerism extends beyond the boundaries of the school and into the neighborhood, where she is the co-director of G.R.E.N.O. (Georgetown Relief Neighborhood Organization). Bringing the school and community together is her priority and she works with Georgetown’s Latino Outreach Program to maintain communication between families and the school. 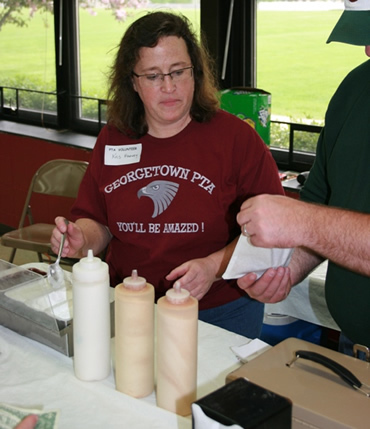 Georgetown PTA President Kris Harvey works behind the counter to prepare homemade donuts for families at the Georgetown Elementary School Fun Fair.